Ronny Yu directs Fearless, about Huo Yuanjia (Jet Li), a Chinese Wu Shu fighter who competes in martial arts tournaments in the 20th Century. Ronny Yu's past films include Freddy vs. Jason,The 51st State and Bride of Chucky. I had the privilege to interview him. Rogue Pictures will release Fearless on September 22nd, 2006. NYC MOVIE GURU: Are you primarily a Mandarin speaker? RY: Primarily Cantonese. Shooting in China then, everyone speaks Mandarin, so I had to really learn. Jet always laughed at my Mandarin. NYC MOVIE GURU: Were the fight scenes dangerous? RY: There was no danger. [sarcastically] Just the usual breaking and bruises, hands breaking. The reason why I love to make this movie is because I have Jet Li. Jet Li for me is the only one in the world that can both act and can perform traditional Chinese Wu Shu. Not Jackie Chan; he’s really just like [an] acrobat. I think Jet had not just such a good technique, but he understands the philosophy. He totally understands that Chinese Wu Shu is not really about just the form, the technique, [and] the movement. It has to embrace body, soul and mind. That is most important. When I first met with Jet and also the choreographer, Yuen Woo-ping, I said that not that we have Jet, we should forget about doing all those quick cuts to a half second cut and all those “fly everywhere” scenes. If we’re going to go back and do a real Chinese Wu Shu movie, we should go back to [the basics]. When I was growing up in Hong Kong, I watched those [films] in the 50’s and the 60’s. You can really see clearly [and] to let the audience appreciate the performance, their movement and all that. But, that’s a problem. Immediately Woo-ping said that there’s a problem because nobody would dare to fight with Jet Li because [he’s] so fast and he’s so good. So, I said, “Fine.” We sent people all over the world [to] find somebody who [is] also a very good martial artist to fight with Jet. I really wanted to go back to the roots where you can see clearly in one punch, one kick. NYC MOVIE GURU: Did filming the weaponry scenes change any of that, though? RY: The weapon is very dangerous because even though some of them are [not real], we still had to have the feeling of the weight. So, it’s still metal, but it’s lightweight metal. And that really required a lot of practice and rehearsal. In the restaurant scene, the guy that fights with Jet, he’s a fantastic martial artist, but he got cut--right in the middle [of his head]. I was looking at the monitor [and] thought [that] maybe it was a bump or something. But then the blood started splashing out and I said, “What have you done, Jet?” and he said, “No, no I didn’t do anything.” But, as you know, any action sequence, even though it’s all coordinated, the adrenaline of the actor [cannot be controlled]. NYC MOVIE GURU: Did he have to get stitches? RY: Yea, 12 stitches. And then, later on, [through] CGI, I had to paint out all the stitches. That’s the good thing about CGI. 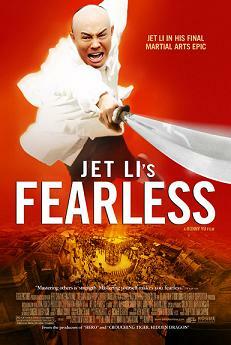 NYC MOVIE GURU: How difficult was it to find somebody as close to the capacity that Jet Li is? RY: Very hard, very hard. Because Jet is known to [not] pull any punches. Especially [in] this one, I really wanted a long take. I wanted at least 10 blows and 2 exchanges and then [a] cut. So that means that the other party had to understand and they have to practice the same style. Otherwise, they would never match [Jet Li’s capacity]. So, we’ve been looking everywhere. It’s easy to find somebody who’s good, but they’re a little ugly. [laughs] It’s a movie, so you gotta have some charisma. We find this fantastic guy, a Japanese karate champion and then I said, “No, I can’t use [him].” So, that’s why I chose this Japanese actor, [Shido Nakamura]. He doesn’t know anything about martial arts, but he grew up the stage, kabuki—those painted [faces] and body movement and gracious and all that. So, he understands about movement. So, we trained him for two months because he had this basic knowledge about movement. [He] understand where the camera [moves] and all that, so that helps. Everybody who watched the movie thought that he’s a fantastic martial artist,[but] no he’s not. He’s a good actor, [though]. NYC MOVIE GURU: How as your directing style evolved? NYC MOVIE GURU: What does Wu Shu mean? RY: If you look at the Chinese writing “Wu Shu”, all Chinese words are made by two different words put together to form a meaning. Actually, the Chinese word “Wu” is not actually [translated as] “fight”. It’s actually made up of “stop” [and] “fighting”—a word conflict. “Shu” [translates] as “technique” or “art form”. So, basically, Chinese Wu Shu is about averting conflict. It’s about stopping. The better you are in Chinese Wu Shu, that means the better peace maker you are. So, that is basically the philosophy behind Wu Shu. So, this time around that I got to work with Jet, we wanted to present an alternative view to the audience. There is character development in the story, there is a moral tale and Jet Li is not just a fighter; he’s also a dramatic performer and an actor. So, this is the challenge or the exercise that we tried to present. NYC MOVIE GURU: Is Jet Li going to do any martial arts again? RY: I think it all goes back to what I just mentioned about the core. This is a Chinese Wu Shu movie. A Chinese Wu Shu movie is different from martial arts. Martial arts is just a generalization. Like, karate is martial arts. The Brazilian self-defense is also martial arts. The martial artists embody so many different things. But, [for] Chinese Wu Shu movies, in order to qualify to be Chinese Wu Shu, first of all, the actor himself has to be a practitioner and he has to do all the moves [without pretending or imitating]. All Wu Shu movies have an obvious theme, a moral theme, a good vs. evil theme—just like Westerns. But, slowly, as time goes by, those qualities have been overcome by Kung Fu, revenge, killing. So, everyone lumps that [into the genre of Kung Fu or Martial Arts]. What Jet is saying is because all he learned from Chinese Wu Shu for the last 30 years, all he learned about the philosophy and the true spirit, he poured everything out in this one. And also, he told me [that] he’s 43-years-old. And almost every bone in his body is all broken up. So, he doesn’t know for how long he can really perform to the audience and [to] let the audience appreciate the movement, the graciousness,[and] the poetry of Chinese Wu Shu. There’s Chi [or energy] inside the body of everybody. When you do a move, it requires a lot of the energy. As age starts creeping up, that takes a lot of toll. It’s not like he’s not going to do [an action film] with gunplay—that’s easy to do. So, after we finished the movie, Jet said to me “Ronny, you now have a mission. You have to explain [that] to everybody.” So, I said, “Yea, I’d love to.” I was in Australia in the Syndey Film Festival and that’s what I told everybody. I think I blame the Hong Kong filmmakers because they were lazy. [They] should let the audience have an alternative view of what that genre is all about. NYC MOVIE GURU: How has the film changed from when it was released abroad? RY: For me, this is the most difficult movie for me to make because, off the top, I wanted to make a movie [that reflects] me and Jet’s ambitions. We wanted to make this movie not just for Asian audiences because of the message. We want people all over the world to understand the message and [to] appreciate [it]. So, after I [did] my cut according to the original script, I sat back, looked at it and said, “No, this is too literal and a little bit preachy.” So, I had to go back and [to] rearrange the whole structure. So, we [brought] the ending back to the front because [I don’t] want the audience to wait 10 or 15 minutes before they see Jet Li. That was in the original cut. So, [for] every single factor in the movie, I had to think and rethink and had to step back and try to be as objective as [possible]. I wondered how I could make this story [universally understandable]. It’s an ongoing balance, an ongoing struggle all the time. And I’m lucky [that] my experiment worked for me because this is the first time that a Chinese film is [edited] by two American editors, [Virginia Katz and Richard Learoyd], [who] don’t understand any Chinese. All they [had] was a translator. I hired Virginia Katz to edit all of the drama and then I hired Richard Learoyd to edit all of the action. My theory was that if these two [people], after the cut the movie, they get touched by it. They understood what that means and [could] cross the barrier. So, the first battle is won. And I hope that [when the film opens on Friday, September 22nd], I’m proven that I’m right. NYC MOVIE GURU: Was it difficult to find locations to shoot? RY: Yes. The whole thing was built: the town, the restaurant—everything. Even the farm, even that village had to be built. We [also] built the rice pad. NYC MOVIE GURU: How long has the film been out? RY: It was released in the Chinese New Year in January ’06. NYC MOVIE GURU: How does the flow of movement in Wu Shu affect your camera work? RY: I lay a long track. I said to Jet Li, “Why don’t we rehearse it in the morning?” And then after lunch we do it. I remember a particular shot on top of the hill and the choreographer would come in in the morning and design all the fantastic moves for Jet. I was looking at it and I said, “No, no, no. It doesn’t feel right. Let’s break for lunch.” And during lunchtime I walked up to Jet and said, “Why don’t we try something? Forget about the design. Forget about the choreographer. Forget about all that. After lunch, I’m going to set up three cameras on three tracks [with] all different lenses. And you forget about everything. I just keep the camera rolling and then you just do your stuff. And go back to when you were, like, 6-years-old or 8-years-old when your master [taught] you. Go back to that state of mind. Use your heart.” And we [did] it in one take. He said, “Can we do another one?” and said, “No.” because I think that only comes once. Even when I think about a Western fighter, it’s the same thing: don’t think too much. That’s why we have casualties because some of the moves [weren’t] planned. I remember that the Spanish swordsman is a very qualified martial artist in Hollywood. He actually taught Michelle Pfeiffer [in] Catwoman [how to use] weapons and all that. He’s also very good with swords. A couple times he got cut by Jet and he cut Jet. I just want that realism, that truthfulness—even in the fight sequences. NYC MOVIE GURU: Do you practice Wu Shu? RY: I love Chinese Wu Shu. I had polio when I was a child, [so] when I went to boarding school in England, I always got bullied. During that time, it was when Bruce Lee was [becoming famous], so everybody pretended to be Bruce Lee. We always hanged out in one of the restaurants in London. One of the chefs said, “Ronnie, you cannot do all that kicking, but I can teach you one style.” And I asked, “What?” and he said, “Wing Chun” which is for women because in China, when wear long skirts, [so] it’s indecent for them to kick so high. So, they practice [with] their hands all the hand movements. So, he said, “Maybe I can teach you that so that when you have problems [like] with somebody in the elevator.” I learned a little bit. NYC MOVIE GURU: What are you doing next? RY: I’m going back to the horror genre. I’m doing Blood: The Last Vampire which is an adaptation of a Japanese anime [film]. NYC MOVIE GURU: Will you work with Jet Li on a non-action film? RY: Oh, yeah. That’s a taboo. No, no, we love to work together here. NYC MOVIE GURU: Why did you walk away from Snakes on a Plane?